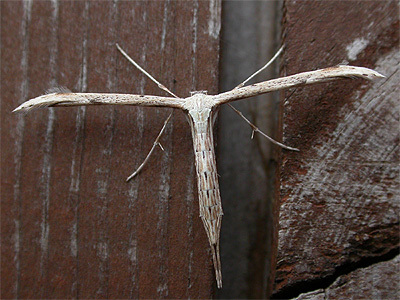 These unusual moths really cannot be mistaken for anything else. As a family they are easily distinguished and should present no problem at all, but the identification to individual species is usually much more difficult. 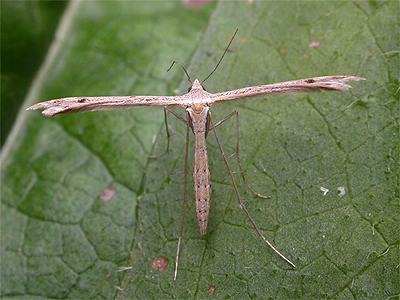 Known as Plume moths, these characteristic moths are members of the Pterophoridae family and many peoples first encounter with them, will most likely be by finding our commonest species, Emmelina monodactyla on a fence during the day. 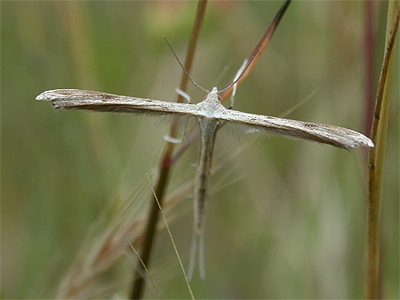 At rest and in flight, Plume moths are not really recognisable as moths at all. 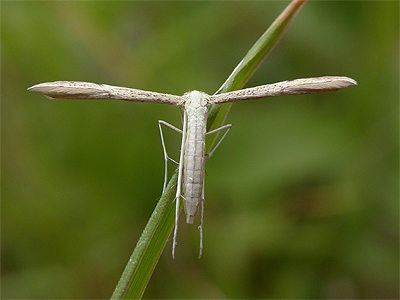 They show no obvious wing shape and the public (even if they recognise them as an insect at all) often presume that they are a type of Crane Fly. From what we can determine, there are certainly 18 species on the Nottinghamshire list. 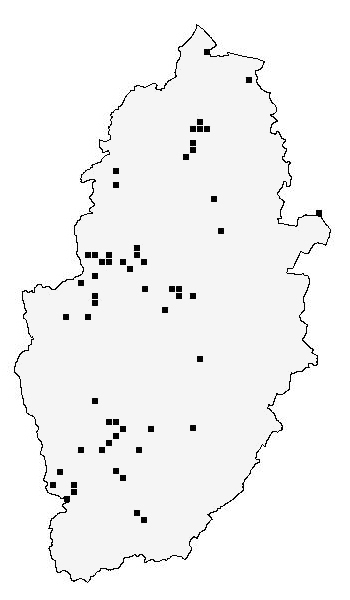 Nationally, the current Pterophoridae species list is 34, so Nottinghamshire appears to be relatively well represented. The species list follows the scientific species names, numbering system and order of species, as used in the Checklist of the Lepidoptera of the British Isles (D. Agassiz, S. Beavan, R. Heckford. 2013). The old Bradley and Fletcher numbers are shown in grey. 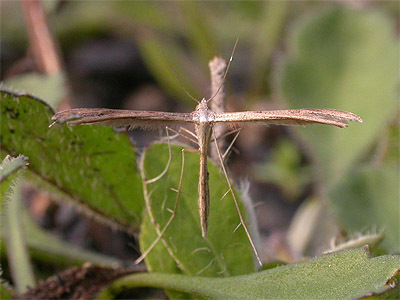 Nottinghamshire's commoner Plumes are without any doubt, Emmelina monodactyla, Pterophorus pentadactyla, Amblyptilia acanthadactyla and Platyptilia gonodactyla. The latter species can be expected anywhere Coltsfoot (Tussilago) grows, but the other three Plumes can be expected at a moth trap operated even well within urban locations. 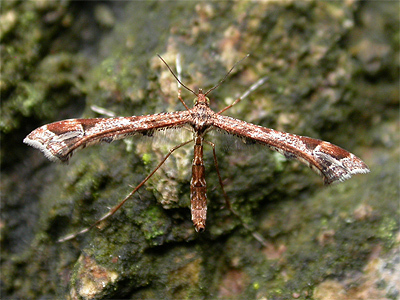 Pterophorus pentadactyla is probably the most easily identifiable of all our Plumes. 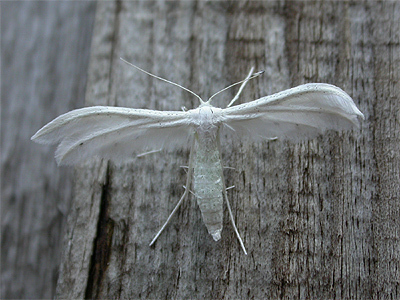 Brilliant white in colour, the wings consist of four, finely feathered 'fingers'. It is another fairly common moth and one that will likely turn up in most peoples moth trap at some point in the year. Please note that several species have recently undergone name changes. 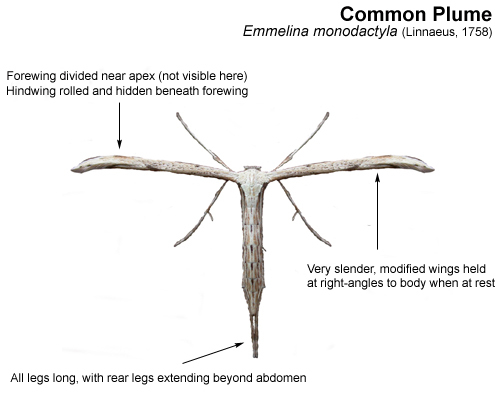 We briefly looked at Nottinghamshire's commoner (and most likely to be found) four Plume Moths, but the county also has records of more uncommon, or rare Plumes. 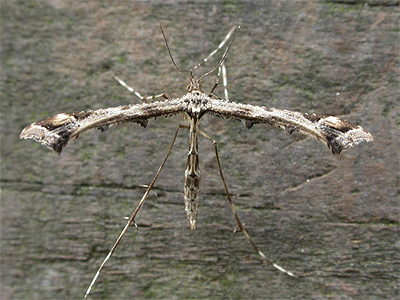 In July 2010, we trapped what appears to be Nottinghamshire's first ever record of Marasmarcha lunaedactyla at Clipstone Old Quarter in Sherwood Forest. The record certainly surprised us, as this was never an expected species. We went on to find it breeding at Hills and Holes SSSI, Market Warsop in 2012 and it has since turned up on a couple of occasions to our MV light run from our garden in the middle of Market Warsop. Additionally, M. lunaedactyla has also turned up at the Idle Valley NR in 2014 (Lound Moth Group) and at Warsop Main Pit Top (Pendleton, T.A. and Pendleton, D.T.) and at Bestwood village in 2015 (Tobin, S.). 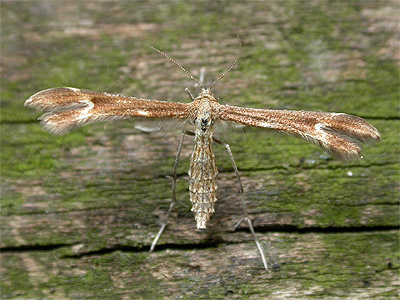 Perhaps even more surprising from a Nottinghamshire perspective, is the historical record of Merrifielda tridactyla, which was recorded from Sherwood Forest around the turn of the last century and which seems even more remarkable for a moth who's larva feeds on Thyme growing in chalk or limestone areas. Taking the view that the record is sound (the recorder was R.E. 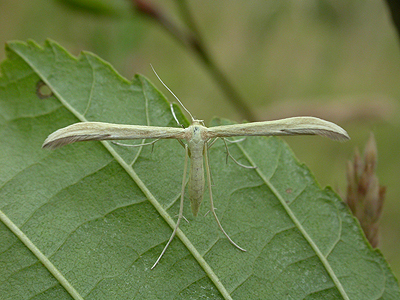 Brameld) then other Plume moths with a more southerly distribution could well turn up, or already be present at sites in the county. 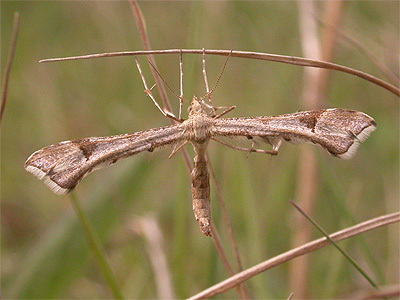 Pterophorus galactodactyla is another rare Plume, found predominantly in the Brecklands of East Anglia, but also at a few other sites scattered across the southern UK. J.W. Carr in his book "The invertebrate fauna of Nottinghamshire" lists a record from Wellow Park in 1900 (Becher) of larvae bred from the leaves of Burdock. Its doubtful, but it may just be worth searching to see if the moth is still present. The map on the right, shows the latest distribution of Emmelina monodactyla in Nottinghamshire. The map is based on our own records and the records sent to us by a numerous individual recorders and local organisations. Despite being a common moth, the patchiness of its UK range is down to observer coverage and recording, rather than the moth actually being absent from many parts of the UK. Its an easy to record species, easily visible when at rest on fences during the dayduring the day, so keep an eye out when next sat idly waiting at traffic lights. 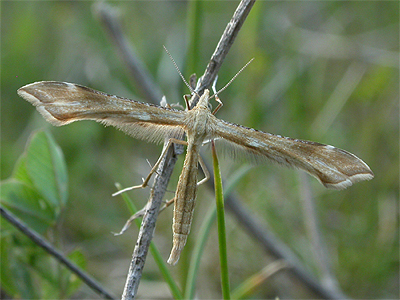 Visual determination of many adult Plume moths is difficult and in some cases, may be better determined by genitalia dissection. Searching for larvae/feeding signs on the correct foodplants and then rearing them to adult in captiity, is often a better way of determining the more difficult species. Correct identification cannot always rely on wing shape, pattern or markings alone. The following table gives the known Nottinghamshire species, flight period and larval foodplants. Determining what species could be present on site can be done effectively during daylight, simply by being aware of the range of plants on site, but this should also be part of a recorders standard practice anyway.